Sherman J. Andrews was born and raised in Lubec, Maine. Sherman was the youngest of three boys who grew up on a dairy farm. He was an athletic student and a hard worker. He worked at a local sardine factory where he packaged sardines. In his free time loved to tinker with engines, and he eventually built a plane from a tractor. He graduated from Lubec High School and was a member of the local Knights of Columbus chapter. In the 1940 U.S. federal census, Sherman lived with his wife, Beatrice, and worked as a stenographer. Before enlisting he worked for the War Department in Washington, D.C. He obtained written permission from his wife to volunteer for service with the U.S. Army Air Corps. During World War II, Lubec, a small town near the Canadian border, was bustling. Fish factories, like the American Canning Company packed sardines. Most townspeople were employed, and children often worked in the factories. During World War II, Lubec sent over 300 men and women to serve the country from this small community. According to the Lubec Historical Society president, Lubec holds a distinction "based on per capita of people in the town" that no other town can boast then or now. Lubec had the largest population in service per capita than any other town or city in the U.S. During the war, the U.S. government made a deal to purchase all the sardines they could produce to be sent to the soldiers in the war for food. Sardines are a great source of protein, and would not go bad because they were sealed in round cans. This is the only time that they were packed in round cans - for the government or anyone. The round cans allowed for 20+ sardines per can, whereas the usual rectangular cans only allowed up to 10 sardines per can. By the mid-1940s, Dow Airfield in Bangor, Maine, became a processing center for soldiers heading to fight in World War II. At the base men delivered their records for processing and updating, aircraft were checked over, and final medical and dental checks were done. Soldiers stayed there until they were assigned to quarters and cleared for departure to the European Theater. The base grew from 600 to 6,000 men by 1945. Second Lieutenant Andrews always wanted to be a pilot but, after enlisting, he did not quality for flight school. According to his grandson, the family believes the reason he did not qualify was a common one. Around the time Andrews volunteered to join the U.S. Army Air Corps, there was a large pool of very qualified young men who wished to be pilots. Many who desired to fly wanted to be fighter pilots. A surplus of qualified candidates at this time led the Air Corps to move some potential pilots to other officer positions that were needed to staff the heavy bomber crews. A man who wanted to be a pilot could still be an officer and fly in the "heavies" as a navigator or bombardier. Eventually, heavy bomber crews dropped one crew member and trained personnel to be dual rated in both the navigation and bombardier capacities. Andrews was such a man. Andrews received training at Maxwell Field in Alabama; Cape Giradeau, Missouri; Panama City, Florida; and Selman Field, Louisiana. By late 1944, the skies over Europe were much safer for the heavies. Andrews served as a group leader in his crew. This was no easy task, especially for a married man who was referred to as "Pops" because of his advanced age of 25! Andrews was assigned to the 445th Bomber Group, 701st Squadron based in Tibenham, England. He was flying a B-24 Liberator. 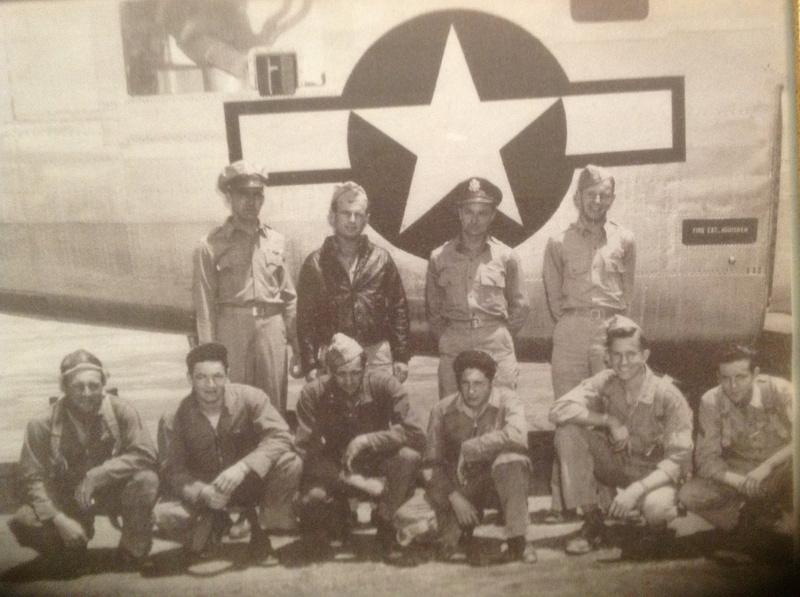 He and his crew were promoted to be squadron leaders as a result of their excellent ratings in training and missions. On December 11, 1944 Andrews was sent on his nineteenth mission, to bomb marshalling yards in Hanau, Germany. The mission was completed, but while returning to England a plane in the lead had issues remaining in formation. The formation flew into heavy cloud cover, and when they emerged two planes were missing, Andrews’ plane and the struggling plane. Reports indicate the two planes crashed midair amidst the heavy cloud cover. The first plane went down near Strasbourg, France and Andrews’ plane crashed into a forest outside of Zinswiller, France where it went undiscovered for nearly 50 years. He left his wife, Beatrice, with three young children- Marybeth, Jean Marie, and Sherman, Jr.
Sherman Joseph Andrews was a young man who grew up in the small town of Lubec, Maine. He was the youngest of three boys and grew up on a small dairy farm. Sherman was a bright kid who had a wild side. He always loved to tinker with small motors and, along with his friend, built a plane out of a tractor. He was very athletic and known to be a good kid by others. He later got a job in a sardine factory before going off to war. Andrews was a great aviator, awarded for his accomplishments and outstanding missions. He was sadly killed in action after his aircraft crashed with another American plane high up in the clouds. The planes and the crews were declared missing after the collision. Andrews’ name was memorialized on the wall of the missing at Cambridge American Cemetery in Great Britain in 1947. His remains were identified more than 30 years later. German hikers stumbled onto a plane crash scene. Human remains were discovered. When the Andrews family were contacted, they sent a DNA sample to compare. The U.S. government used DNA technology to identify his remains. At the request of the family, Andrews was buried close to his wife Beatrice at the Jefferson Barracks National Cemetery in St. Louis, Missouri. In this project I learned that sacrifice is more than just giving up your life for war and for loved ones. It is a story that can be told by many of the fallen soldiers that had fought in this war for the modern generation. Soldiers are not forgotten, they are learned from and survived by family and history records that tell great stories that we as students can help share. Maine. Washington County. 1930 U.S. Federal Census. Digital Images. http://ancestry.com. Maine. Washington County. 1940 U.S. Federal Census. Digital Images. http://ancestry.com. 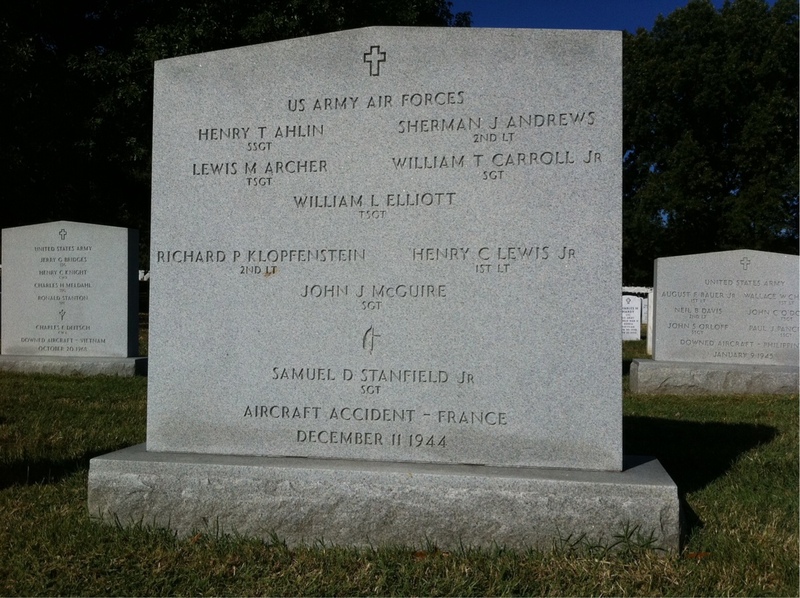 Photograph, Memorial marker for Sherman J. Andrews and his air crew at at Arlington National Cemetery, section 60, site 8024. Arlington National Cemetery. Image. http://ancexplorer.army.mil/publicwmv/. 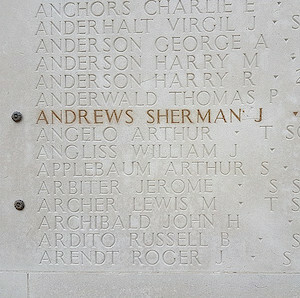 Photograph, Sherman J. Andrews’ name on the Wall of the Missing at Cambridge American Cemetery. April 2017. American Battle Monuments Commission. Image. http://ancexplorer.army.mil/publicwmv/. Schaffer Family Photographs. 1940-2015. Courtesy of Brian Schaffer. Schaffer Family Scrapbook. 1940-1944. Courtesy of Brian Schaffer. 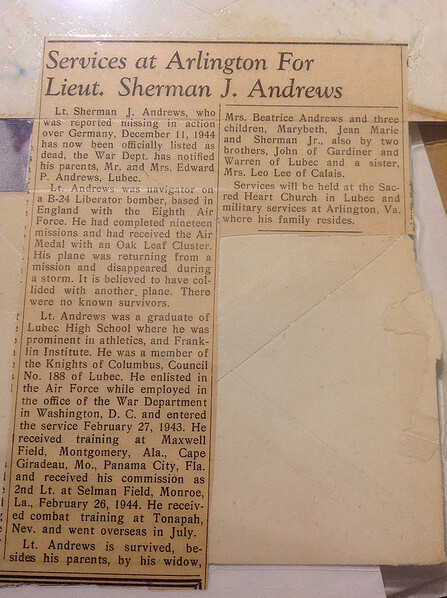 Sherman J. Andrews, Individual Deceased Personnel File, Department of the Army. Sherman J. Andrews, Official Military Personnel File, Department of the Army, RG 319, National Archives and Records Administration - St. Louis. Bergquist, David H. Bangor in World War II: From the Homefront to the Embattled Skies. Charleston: The History Press, 2015. Freeman, Roger A. The Mighty Eighth: A History of the Units, Men and Machines of the 8th Air Force. London: Cassell, 2000. Miller, Donald L. Masters of the Air: America's Bomber Boys Who Fought the Air War against Nazi Germany. New York: Simon & Schuster, 2007. Schaffer, Brian. Email interview with author. April 25, 2017. Sellito, Barbara. Email interview with author. July 18, 2017. 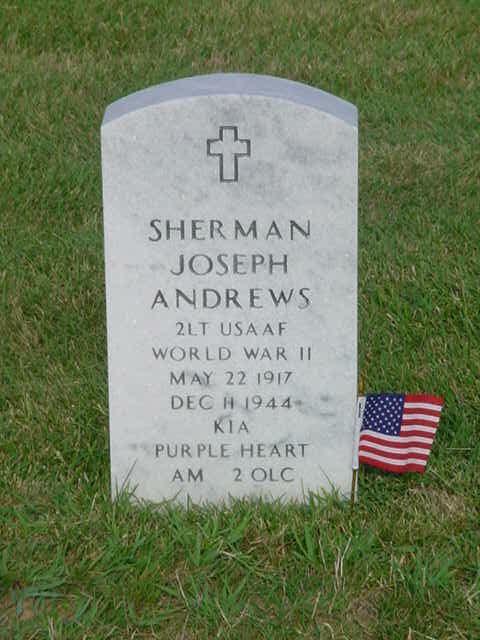 “Sherman J. Andrews.” American Battle Monuments Commission. Accessed December 11, 2016. https://abmc.gov/node/538612#.WXOd5YqQxE4. “Sherman J. Andrews.” National Gravesite Locator. U.S. Department of Veterans Affairs National Cemetery Association. Accessed September 25, 2017. https://gravelocator.cem.va.gov/index.html?cemetery=N852.